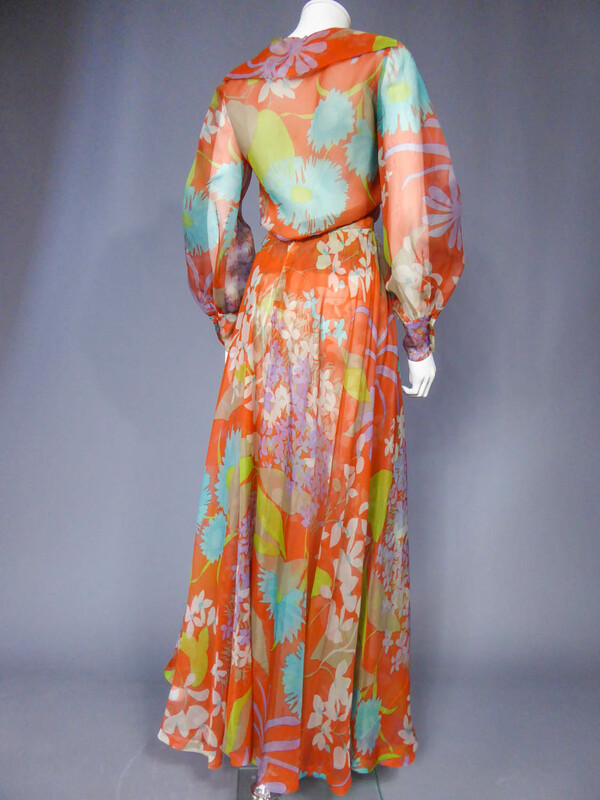 Yves Saint Laurent Couture printed organza skirt and blouse numbered 25276 – Paris collection spring summer 1969. 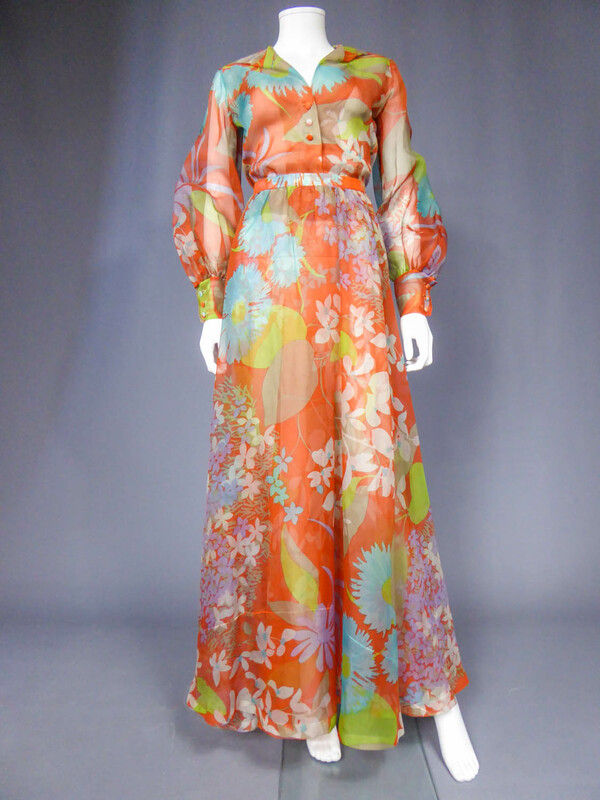 The set, long skirt and blouse with pouffed sleeves made in a Maison Abraham silk organza. 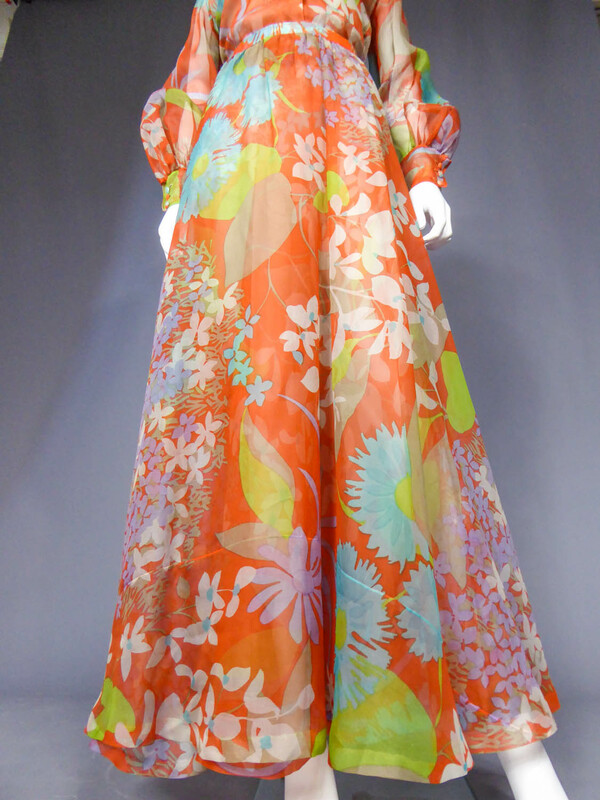 large scale floral printing in orange, blue, turquoise and gray An Yves Saint Laurent woven Couture label numbered 25276. 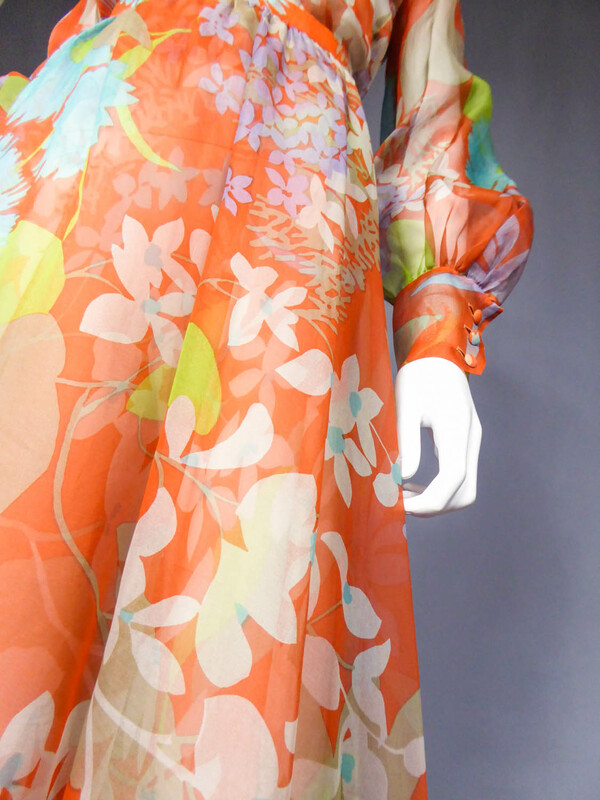 A blouse of similar print and cut is illustrated as part of an ensemble in l’Officiel de la Mode n°563, 564 p.386. 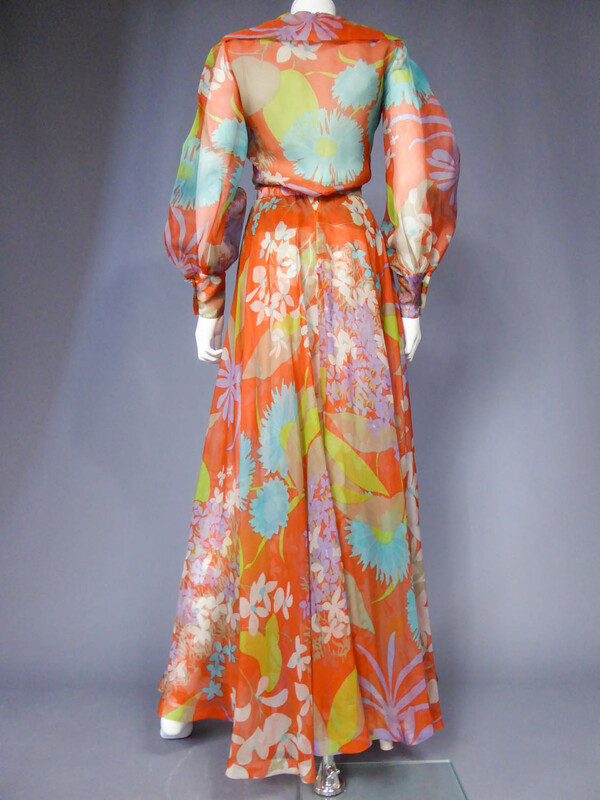 Yves Saint Laurent revives in the 1960s with the French tradition of large floral motifs printed especially by Maisons Bianchini Ferrier or Abraham. 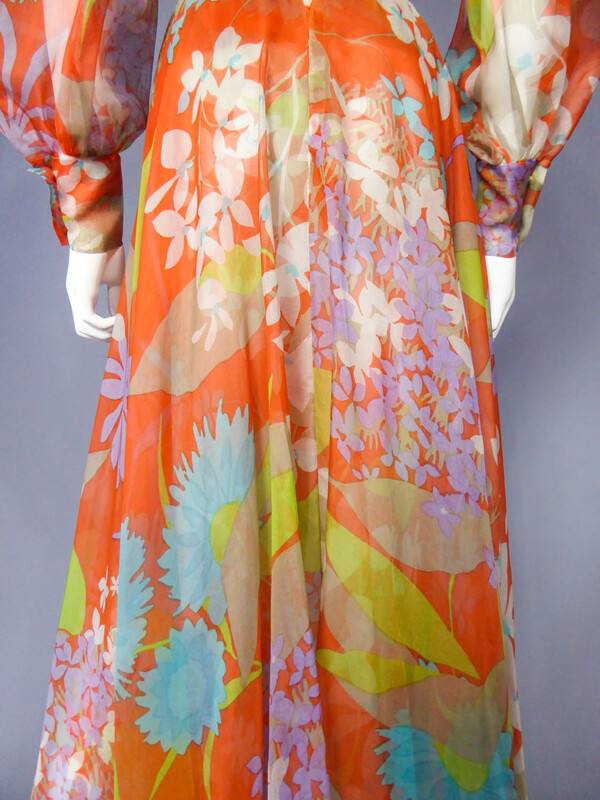 For memory, French Lyon silk and 18th century chintz already declined oversized designs for furniture or dress in the early eighteenth century. 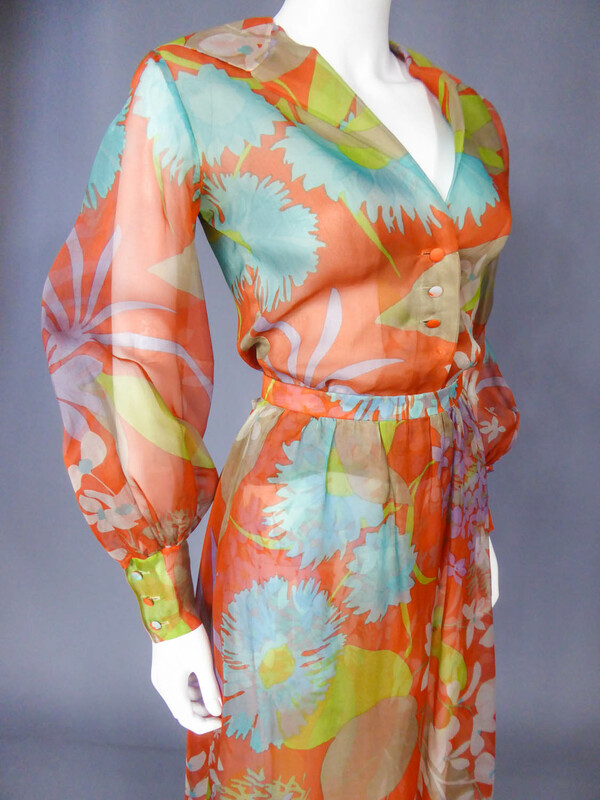 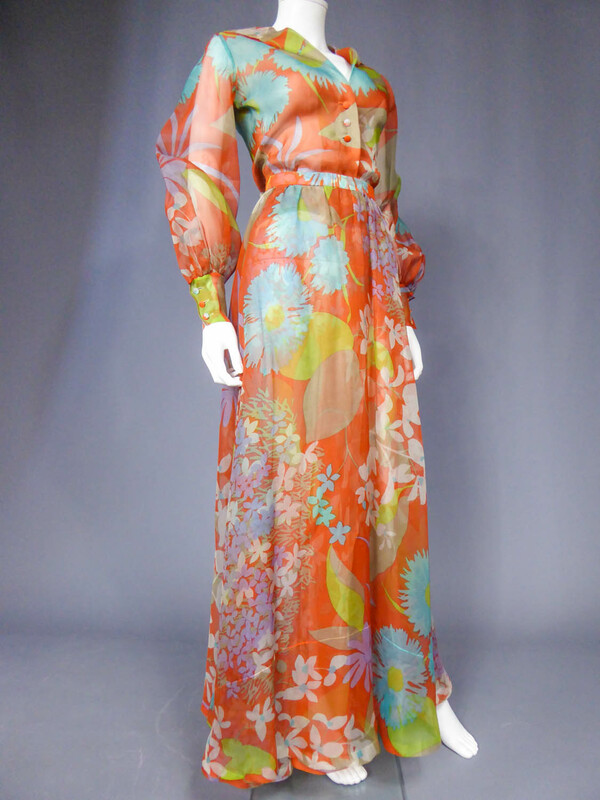 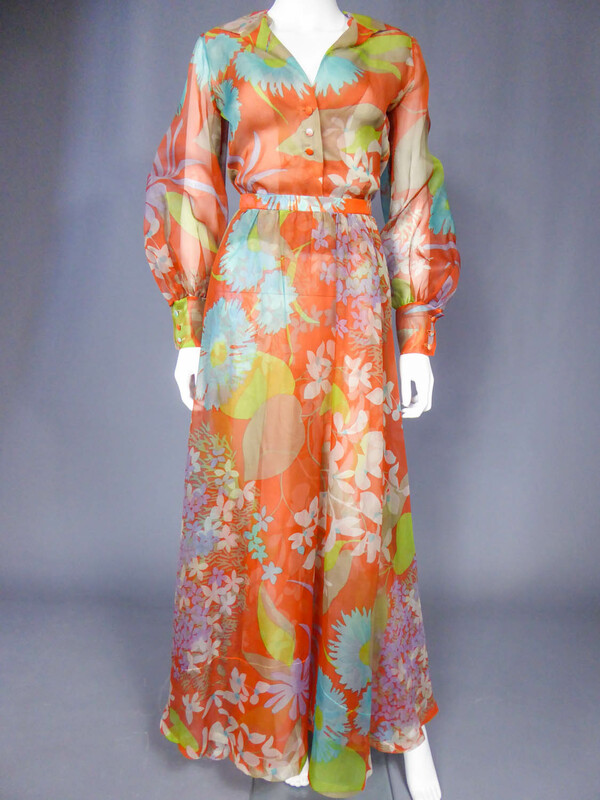 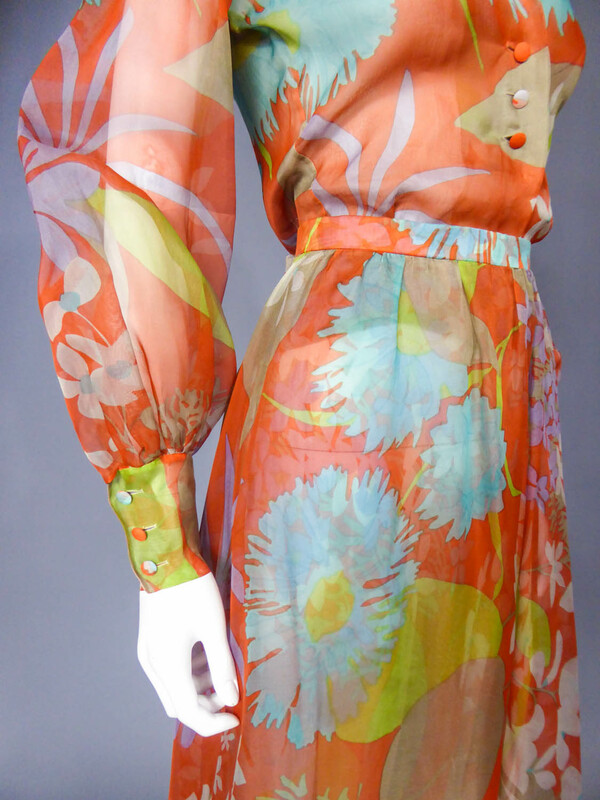 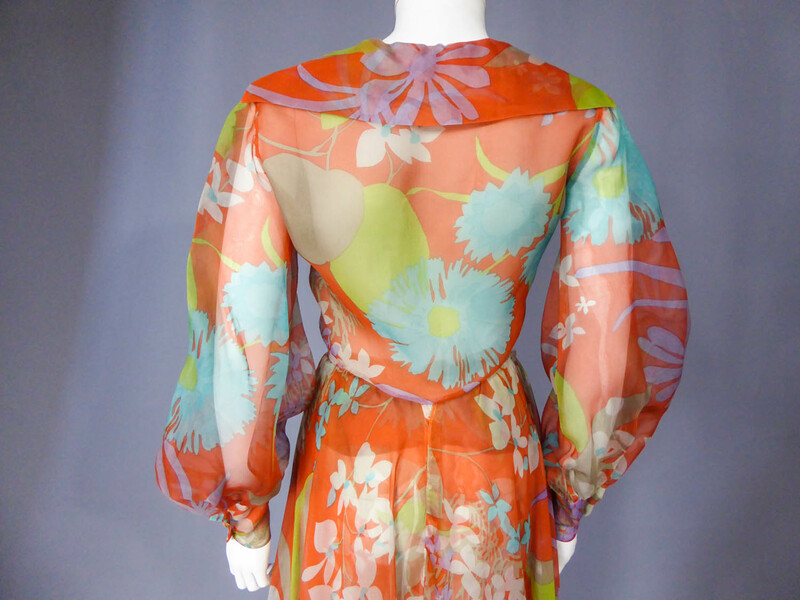 This romance-supported dress precedes the liberation movement of the 1970s.Excellent condition and color. 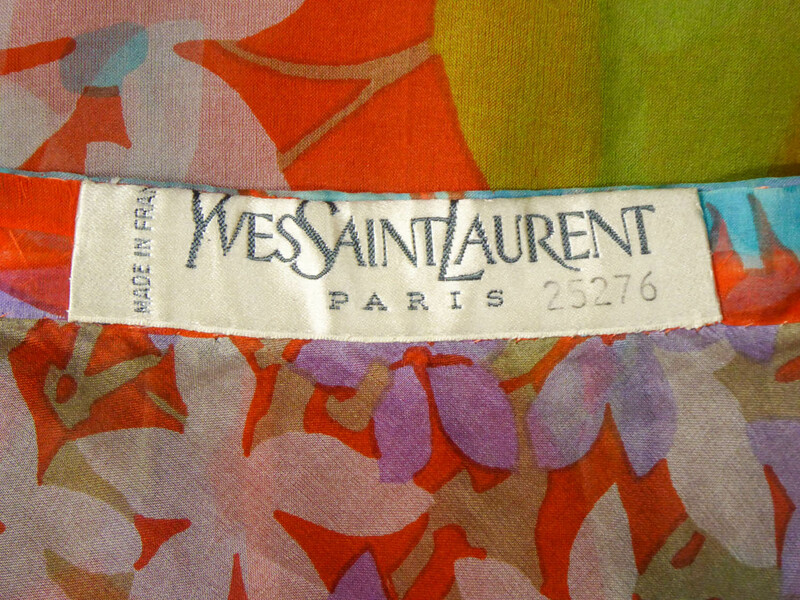 Dimensions: Equivalent French Size 34/36 France. 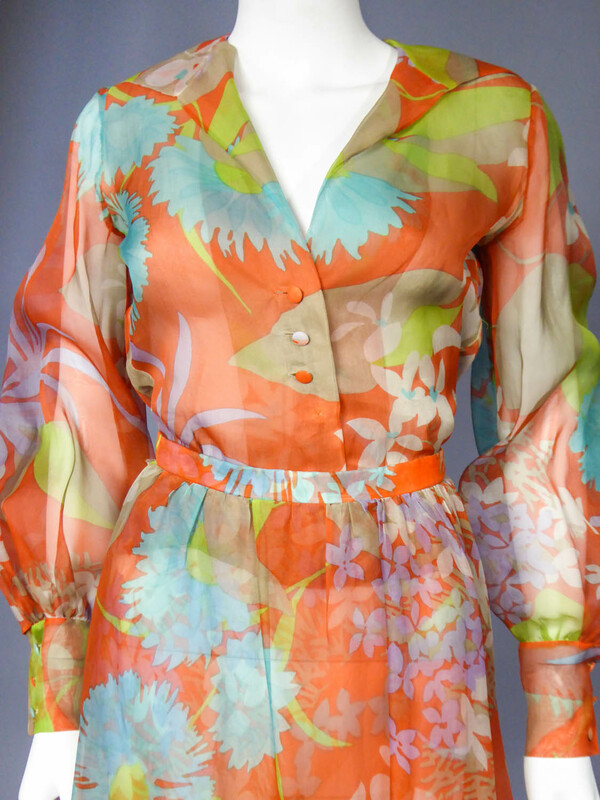 Blouse: Height 53 cm, Waist 64 cm, Sleeves 58 cm, Shoulder 36 cm, Chest 82 cm. 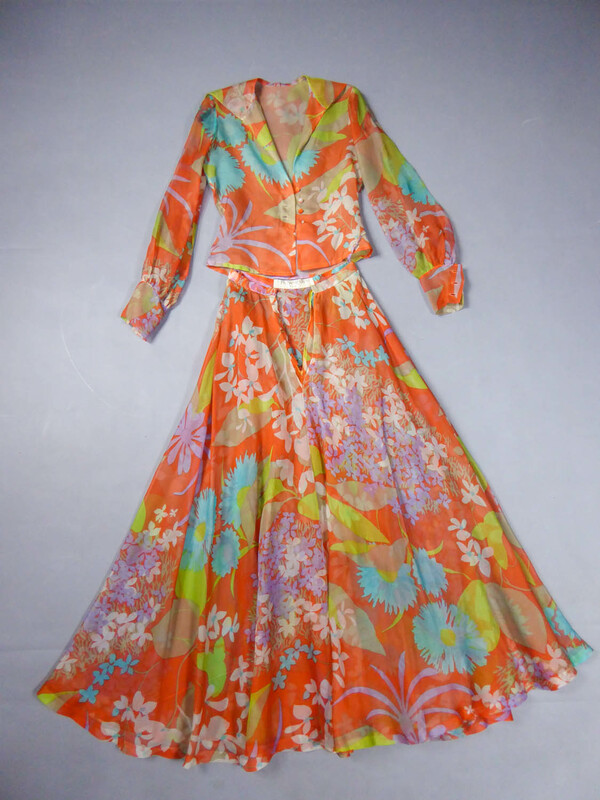 Skirt: Height 110 cm, Waist 62 cm, Hips 85 cm, Skirt bottom 395 cm.